Retired September 1, 1974. Died June 10, 1992. 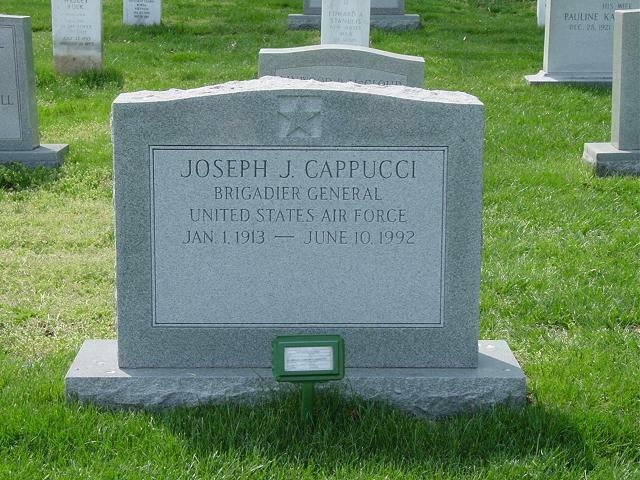 Brigadier General Joseph J. Cappucci was director of defense investigative service, Office of the Secretary of Defense. General Cappucci was born in Bridgeport, Connecticut, in 1913. He attended elementary and high schools in that city. He graduated from the University of Wyoming and received his commission as a second lieutenant, Army Air Corps Reserve, from the Reserve Officers Training Corps program in June 1935. General Cappucci entered active military duty in October 1940 with initial assignment at Westover Air Base, Massachusetts. In May 1942 he attended the Command and General Staff School, Fort Leavenworth, Kansas, upon completion of which, he was transferred to the European Theater of Operations and placed on special duty with the British Intelligence Service. After his return to the United States in 1944, he performed duties as a counterintelligence and intelligence officer with the Army Air Corps until July 1946, when he was placed on detached service to the Central Intelligence Agency. He was integrated into the Regular Air Force in 1946 and in May 1947 he was transferred from the Central Intelligence Agency to the Directorate of Intelligence, U.S. Air Force. He was assigned to the Counterintelligence Division, Directorate of Special Investigations, in August 1948 when the Office of Special Investigations was activated. In January 1952 he was transferred to the Directorate of Special Investigations, U.S. Air Forces in Europe, and served as chief, Counterintelligence Division. While in USAFE, he was a member of various intelligence boards in Germany, France and other areas in USAFE, and was responsible for putting into effect a counterintelligence program throughout all USAFE areas of interest. General Cappucci was awarded the Legion of Merit by the Commander in Chief, USAFE, for his outstanding performance of duty during this period of service. Upon his return to the United States in August 1955, he was assigned to the Counterintelligence Division, Directorate of Special Investigations, U.S. Air Force. In August 1958 he was assigned as commander, OSI District 13, Offutt Air Force Base, Neb., and held this position until February 1961, when he was assigned as director of special investigations, Pacific Air Forces. General Cappucci was awarded another Legion of Merit by the commander in chief, PACAF, for outstanding service as director of special investigations, PACAF. He was transferred to the Office of The Inspector General, U.S. Air Force, in January 1964 and assumed the duties of deputy director of special investigations for operations in the Directorate of Special Investigations. He was appointed director of special investigations, and commander, 1005th Special Investigations Group in June 1964, which at that time was a worldwide, centrally directed organization. 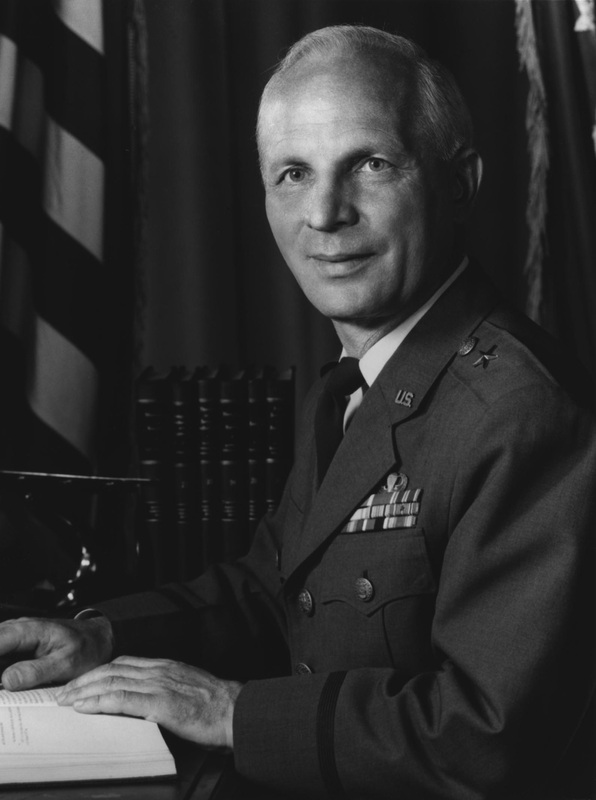 Genera1 Cappucci retired Aug. 31, 1967, and was recalled to active duty September l, 1967, to again serve as director of special investigations and commander of the 1005th Special Investigations Group. He was awarded two Distinguished Service medals for exceptionally meritorious service in a duty of great responsibility as director of special investigations. On December 31, 1971 the Air Force Office of Special Investigations was created as a separate operating agency. General Cappucci retained his position as director of special investigations while also becoming Commander, AFOSI. At that time, the 1005th Special Investigations Group was disestablished. In April 1972 General Cappucci was appointed director of Defense Investigative Service, Office of the Secretary of Defense. Besides the Command and General Staff School, he also has attended the U.S. Air Force Special Investigations School, British Secret Intelligence School, Air Intelligence School, Radar Observer Intelligence School and the Airborne School, and holds the ratings of parachutist and gliderman. In addition to the United States military decorations, he has been awarded the National Order of Vietnam in grade of Knight; Vietnamese Medal of Honor, 1st Class; Vietnamese Air Service Honor Medal; Philippine Legion of Honor; Philippine Legion of Honor (Commander); Most Exalted Order of White Elephant (2d Class-Knight Commander) (Thailand); Republic of Vietnam Air Force Distinguished Service Order (First Class); the Special Cravat of the Order of Cloud and Banner - Republic of China; Republic of China Police Medal; and the Order of National Security Merit Cheon-Su Medal, Republic of China. He was promoted to the temporary grade of Brigadier General effective June 1, 1965, with date of rank May 22, 1965. Barbara G. Cappucci, 90, of Hilton Head Island, formerly of Falls Church, Virginia, and Salem, Massachusetts, died Saturday, July 9, 2005. She was born in Beverly, Massachusetts, daughter of Mr. and Mrs. Garnet L. Gibson and wife of the late Brigadier General Joseph J. Cappucci. She graduated from nursing school in Boston. With the onset of World War II, she was commissioned in the Army Nurse Corps. She and her future husband met at Westover Field in Massachusetts and were married there. Her husband had many different postings during his 40 years of military service and culminated his career as the Air Force Director of the Office of Special Investigation. Mrs. Cappucci enjoyed the many worldwide travels and postings as a military wife and was active in the community each of their assignments. Survivors include two nephews, David Schofield of Hilton Head and William Gibson of Andover, Massachusetts. A graveside service will be held at a later date at Arlington National Cemetery.